Cooperative associations have been organized throughout history to carry out many different activities, often in response to economic and social stress. Cooperative organizations in the United States appeared very early, reflecting both the European heritage of early settlers and the basic need for cooperative solutions in rural conditions. The first recognized cooperative business in the U.S. was a mutual fire insurance company, founded in 1752 by Benjamin Franklin. It continues to operate today. U.S. cooperative development was futher informed by the British Cooperative Movement. The Rochdale Society of Equitable Pioneers was formed in 1844 by a group of 10 weavers and 20 others in Rochdale, England. They came together to open their own store selling food items they could not otherwise afford. They distilled the now famous Rochdale Principles. Ten years later, the British Cooperative Movement had grown to nearly 1,000 co-operatives. The cooperative model works well in many situations, but it always starts with a group of people who decide to provide certain goods or services for themselves. Often, this is after concluding that they cannot get the quality, quantity, or price they desire from somewhere else. ​Co-ops range in size from small store-fronts to large Fortune 500 companies. In the U.S., there are 48,000 co-ops serving over 130 million members; two of every five citizens belong to a co-op. Worldwide, some 750,000 co-ops serve 800 million members. A cooperative is distinguished from other types of businesses by its governance and profit distribution. 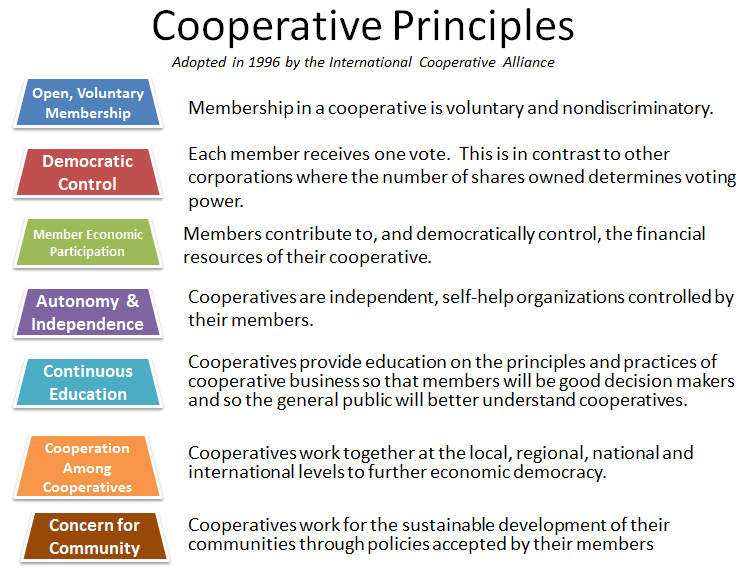 Members govern the cooperative, usually through a democratic process. 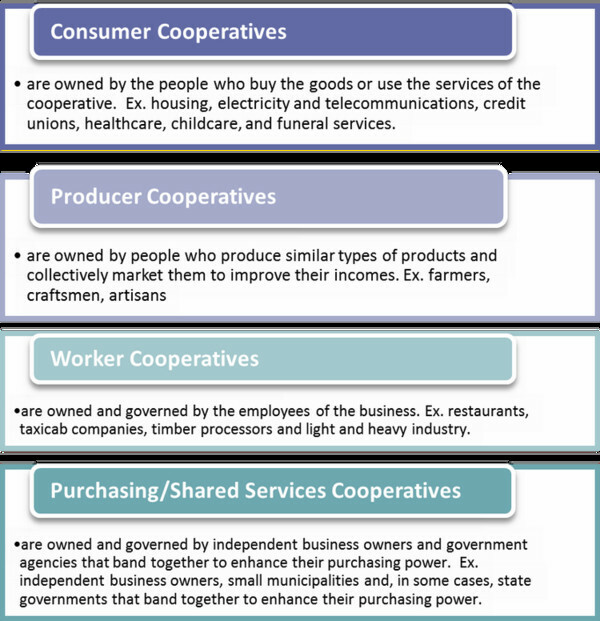 Cooperatives operate under the one member, one vote system. Cooperatives can be contrasted to investor-owned corporations where voting is tied to the number of shares owned. Someone who owns 1000 shares of Company X will have 10 times more votes than the person who owns 100 shares. Profits generated by the cooperative are returned to the members based upon their use of the cooperative’s services. These profits, when returned to members, are referred to as patronage refunds. A cooperative generally strives to operate at cost so members receive as high an immediate economic return as possible. For example, a cooperative whose business is to buy bulk ingredients for its members would re-sell product to the members as close to cost as possible. At the end of the fiscal year if any income remains after paying all the expenses, this would be returned to the members according to how much they used the cooperative. If $10,000 in profit remained after expenses, Member A that bought twice as much from the cooperative as Member B would receive two times more patronage income.